The Mary Ainsworth Collection consists of 114 lots amounting to over three hundred volumes of Japanese Artists' books. The works are mostly concentrated in the late Edo (1603-1867) and Meiji periods (1868-1912) with a few from the Taisho period (1912-1926). The collection also holds seven wood blocks for printing (two surfaced with etched metal plates). 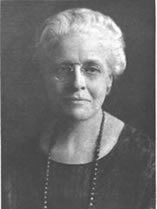 Mary A. Ainsworth first traveled to Japan in 1905. Over the next 25 years, she steadily acquired a collection of Japanese prints and books of impressive breadth and depth. Ainsworth bequeathed her collection to Oberlin College in 1950. For further information about the collection and Ainsworth's bequest, consult the article below. "The Mary A. Ainsworth Bequest of Japanese Prints and Books" (1950) Allen Memorial Art Museum Bulletin 7 (3), 61-74. Mary A. Ainsworth graduated from Oberlin College in 1889. Her collection of Japanese Books and Art Prints was bequeathed to Oberlin College in 1950. The Allen Memorial Art Museum has the Ainsworth Collection of prints and Oberlin College Library has the Ainsworth Collection of Japanese Artists' Books. This an ongoing project with more than half of the objects being described. Please enter the collection here. The Tokugawa Shogunate imposed a strict social hierarchy on Japan during the Edo (1603-1867) period. This well defined system of social status meant that merchants, members of the wealthiest class, were excluded from serving in government positions. Combined with a period of peace and prosperity, this exclusion from the expensive task of governing left the merchant class with an excess of capital. The merchants used their disposable income to patronize the arts: printers, artists, actors of the Kabuki theatres, as well as courtesans, were paid for their services. The merchant lifestyle, with its celebration of pleasure, beauty, and sensuality, became known as Ukiyo or "the floating world." Pictures of the floating world, or Ukiyo-e, were often included in travel books, works on popular Kabuki actors, artist copy-books, books of Kimono and Ikebana (flower arranging) patterns, and picture books. In 1868, Japan underwent major political and social upheaval. After the abdication of the last Tokugawa Shogun and the restoration of the Meiji Emperor, the West was finally allowed access to a nation that had sealed its borders to outside influences for many years. Western traders brought back to Europe scores of wood-block prints and Japanese artists' books, and many western artists and intellectuals visited Japan. These works created a surge of interest in Japanese aesthetics in Europe and America, inspiring many artists, particularly the Impressionists, to mimic their bold lines and dramatic use of form.